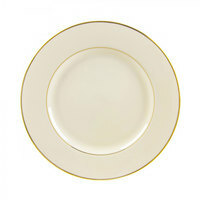 10 Strawberry Street cream double gold porcelain dinnerware is a collection with subtle gold lines around the edges of each dish, which adds a touch of upscale decoration to your tabletops. 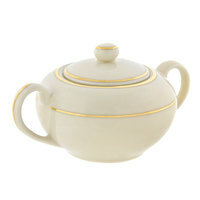 The gold rings add an old-fashioned charm, and the cream color provides a light background for your food to stand out against. The dishes in this line are also available in a variety of sizes, so you can find something to fit with all of your signature menu items. Also make sure to check out other great items from 10 Strawberry Street. 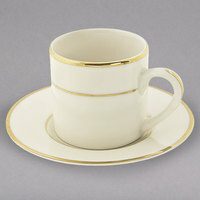 Add charm to your place settings with 10 Strawberry Street cream double gold porcelain dinnerware. 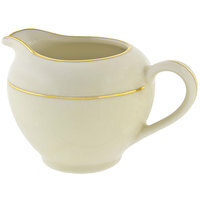 This line of dinnerware includes plates, bowls, creamers, and cups, so you can serve almost anything with matching pieces. 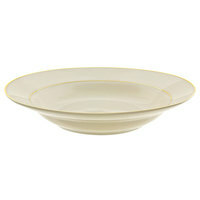 We also carry these dishes in different sizes, perfect for serving both small and large menu items. This line is even made with high-quality porcelain, which will withstand the demands of commercial use and impress customers with its quality. For more dinnerware options, check out our World Tableware Slate dinnerware, Tuxton Seabreeze dinnerware, and Homer Laughlin Lyrica dinnerware. 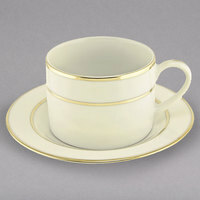 If you're wondering where to buy 10 strawberry street cream double gold porcelain dinnerware, we have a large selection of 10 strawberry street cream double gold porcelain dinnerware for sale at the lowest prices.